The look of admiration on a mother's face will bring anyone to tears. Gambrel Barn has a loft with windows that makes for a great place to do these photos. When a bride has the moment of finally standing in her wedding dress, it is a time to be alone so all of the emotions can flow. Typically, the mother of the bride has helped during the wedding planning process, been present during consultations and it is a day filled wih emotion watching her daughter become a wife. 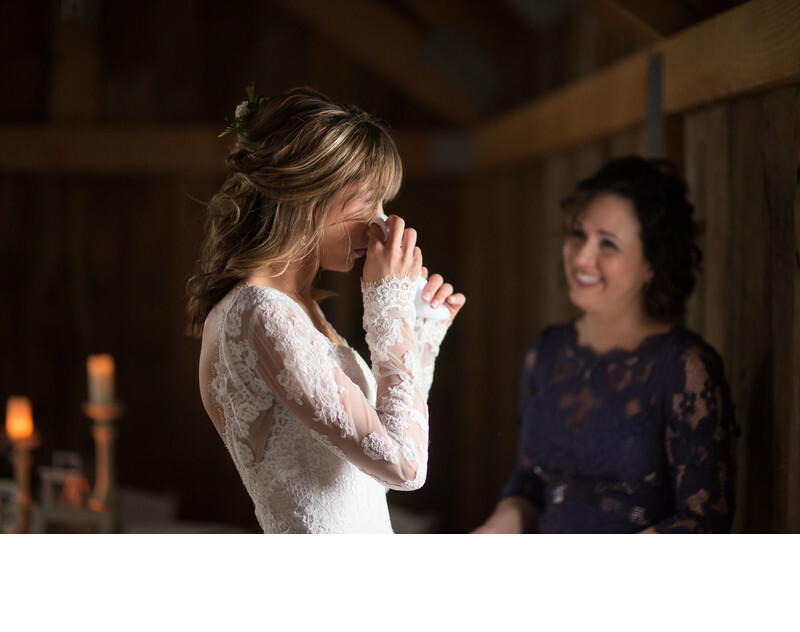 The natural light from this wedding venue is falling perfectly on this mother and daughter. This bride is wiping her happy tears with the hankerchief of her soon-to-be husband's late grandpa. The wedding dress she is wearing was transformed from a strapless dress to a classic, wedding gown where the lace was hand placed along the sleeves. Gambrel Barn is a great venue choice for the bride that is looking for an elegant, rustic location for their nuptials to take place.